Wouldn't it be nice to take a slow boat to nowhere? 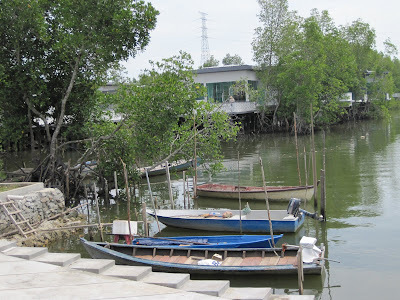 The picture of these small boats with flat bottoms, used along the coasts and rivers of Southeast Asia was taken at the Jetty Complex, Sungai Merbok in Kedah, Malaysia. These boats or sampans remind me of Gavin Young's Slow Boats to China (1981) and Slow Boats Home (1985) which detail his "ship-hopping adventures". These books are standing in the bookcase in my living room, beckoning to me to read them again. And I will do that soon. During the mid-1990s, i met an amazing woman by the name of Pat Henry. The avid painter from California made a round-the-world journey on her yacht, and the trip was financed by her artwork which she produced and sold at each port of call. Her stops in Southeast Asia included Lumut and Singapore. When i spoke with her, she shared about surviving hurricanes in the Pacific Ocean. Pat Henry upon her return home subsequently wrote a book about her solo odyssey entitled By the Grace of the Sea. I am hoping to get hold of a copy someday!